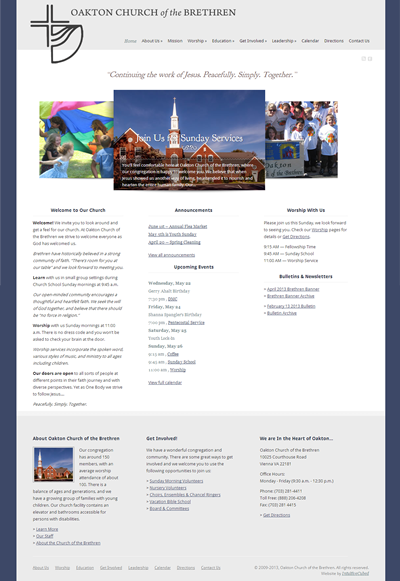 We were delighted when Oakton’s Action and Reflection Committee contacted us to redesign their church website. They were frustrated because their in-house efforts to build a website had dragged on for at least two years with no substantial output. They asked us for a clean, elegant, and friendly website. They also needed a way to publish MP3s of sermons, and told us they would love a photo slider. Oakton’s existing site had lots of good content that needed to be organized and updated. We began by working with them on their information architecture and site structure, while at the same time starting from scratch on the design. We presented the committee with several mock-ups, each of which gave them a way to welcome visitors, while easily sharing events and information with their congregation. We implemented a photo slider on the home page that provided lead-in and point of interest for priority topics. We worked with the committee to update content and integrate new photos while the site was under construction. The new site was built with a content management system that will allow church staff to update and maintain content, post events, and list new sermon MP3 files. Oakton Church of the Brethren was thrilled with the results, and so are we! It was a joy to build a website that reflects such a strong congregation.